Prior appropriation, the governing idea behind water law in the Western United States, requires proof of a "beneficial use" of water to secure a water right. Since the 1800s, a "beneficial use" was generally thought of as taking water out of the river and using it for economic gain. Roughly 150 years of water development later, the West has a thriving river recreation economy. 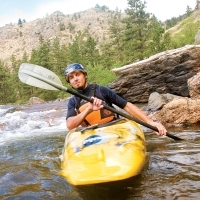 In Colorado, commercial whitewater rafting is a $61 million industry with a $155 million economic impact (http://www.croa.org/media/documents/pdf/2011-commercial-rafting-use-report-final.pdf). The outdoor recreation industry itself is a national economic giant at $646 billion in revenues and employs more Americans than any other industry (http://www.outdoorindustry.org/pdf/OIA_OutdoorRecEconomyReport2012.pdf). All river managers know that water is the key element of any outdoor recreation. It seems obvious but, in 1992, the value of water for recreation had to be argued in front of the Colorado Supreme Court. In the end, the court found that recreation constituted a "beneficial use" of water and therefore could be reason to secure a water right, protected under state law. This set off a 20-year legislative tug of war between traditional water developers and the new economy. The nuances of water law are state-specific; Colorado's laws around its newest beneficial use have become known as Recreational In-Channel Diversions, or RICDs. The legislative tug of war is due to the sheer volume of water that recreation can now legally secure in Colorado. Water rights up to 2,500 cfs have been claimed. These are magnitude greater claims than have been made in the past and greatly inhibit ideas of endless future water development. The legislative battles have narrowed the applicability of RICDs only to human-made structures designed for non-motorized boating, and they can be claimed only by certain governmental bodies. An RICD helps to protect the investment Colorado communities make in whitewater parks and the economic benefits associated with those parks. The unique attributes of RICDs are that they keep water in the river channel, they are non-consumptive, and they approximate the fluctuation of the natural hydrograph. These attributes also have the incidental benefit of keeping our rivers healthy with flow. Jason Carey is the principal river engineer at RiverRestoration, having more than 15 years of experience in river design as a leading innovator in the field. Currently based in Carbondale, Colo., Jason is continually developing new solutions for our rivers. Established in 2004, RiverRestoration is a river design and engineering firm working to revitalize waterways across North America. With a track record that includes management of more than 70 major projects, RiverRestoration provides the creative planning, engineering, and technical support required in any successful river project.